Today, Friday the 20th of January, candidates from all Palestinian political parties and factions, including Hamas, Fatah, Al Mubadara, Democracy Front, Independent and others came to the villagers of Bil’in. 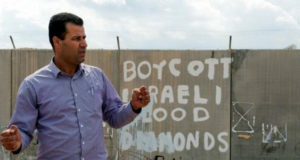 There they were joined by over 300 Israeli activists, 100 Internationals and many Palestinians from the surrounding area. It was one of the most impressive gatherings of Palestinians, Israelis and Internationals in Bil’in, in what is now close to a year-long struggle against the theft of their lands by the Apartheid Wall. At 12:30 PM, close to 2000 people marched through the lands of Bil’in to the construction site of the Apartheid Wall. At the site were over fifty Israeli Military, Police, and Border Policemen. They became violent towards the crowd very quickly, using their batons, sound bombs, against unarmed demonstrators. They were followed there by approximately 20-30 soldiers, but they were powerless to stop the crowd from gathering at the Bil’in outpost. Joining the Popular Committee Against the Wall in Bil’in were electoral candidates, Qais Abu Leila from Democracy Front, Abu Ala from Fatah as well as Uri Avnery and other members of Gush Shalom, and other Israelis and internationals. Soon the people left the outpost to rejoin the rest of the demonstrators at the wall site, where soldiers had been firing tear gas canisters and some rubber-coated metal bullets as well. 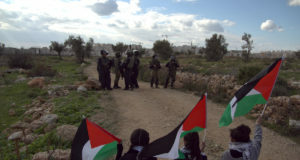 Once the groups had rejoined, the international and Israeli activists gathered with the people of Bil’in near a metal gate located near the wall and continued the demonstration against the Wall. This was met by a coordinated attack by the Israeli Police and Military forces, who were determined to detain Palestinian and/or Israeli activists by force. In the past months, this has been a favorite tactic of the IOF; they detain and beat Palestinian demonstrators and then use them as leverage to end the demonstration. Despite their use of force and beatings, the IOF was unable to arrest any of the Palestinians, as the activists were able to de-arrest as many as five Palestinians that the IOF attempted to detain. One Israeli was arrested, and beaten in the process, but he was released after the conclusion of the demonstration. 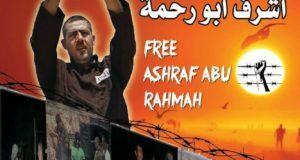 According to Abdullah Abu Rahma, coordinator of the Popular Committee Against the Wall in Bil’in, “We marched towards the Separation Wall construction site, and the army met our peaceful procession with extreme violence”, Abu Rahma also reported that “dozens were injured after soldiers fired rubber-coated bullets and gas bombs; Israeli soldiers also hit several residents with batons”. By 4:00 PM, the demonstration was at an end and the people were returning to the village. It was a successful day of unity and solidarity for the Palestinians and their supporters in the struggle against the Wall, but it was even more important for the people of Bil’in, who have continued their struggle without fail for almost a year.